Linocut Prototypes + Bagan Drawing Giveaway! 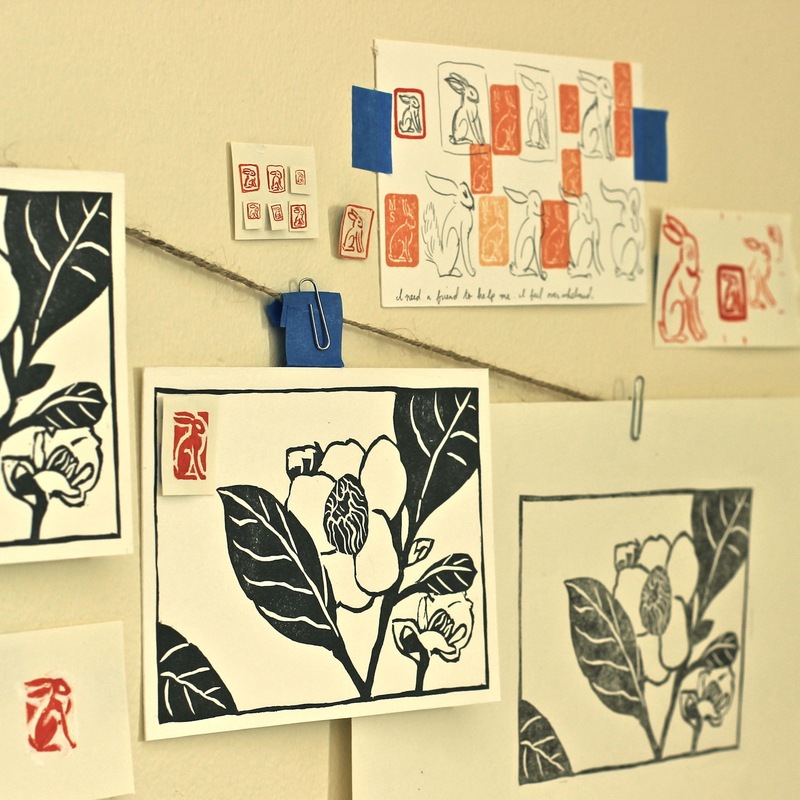 Linocut prototypes featuring the Camellia Kissii drying on my studio wall. The Thailand Burma Flora Fauna project is taking shape! These past few weeks have been packed with carving print blocks, printing and testing prototypes, planning and ordering supplies, and networking. THANK YOU for all of your patience and continued support while I work to get you the best prints possible! This week I am giving away an original drawing to one of my followers on Instagram as a thank-you for reaching more than 1K followers! If you are an instagram user, please feel free to follow my feed and enter for the giveaway. (My username is mike_schultz_paintings). I am also selling two variations of the same drawing on my Etsy shop— first come, first serve! The Bagan drawings are directly related to the Thailand Burma Flora Fauna series as they are preliminary illustrations for the additional print I am designing which depicts the moon rising over the Bagan Plain in Bagan, Burma– something I was very fortunate to witness with my own eyes! Drawing giveaway on instagram depicting the Bagan Plain featured in an upcoming print for the TBFF series. Sneak Peek! 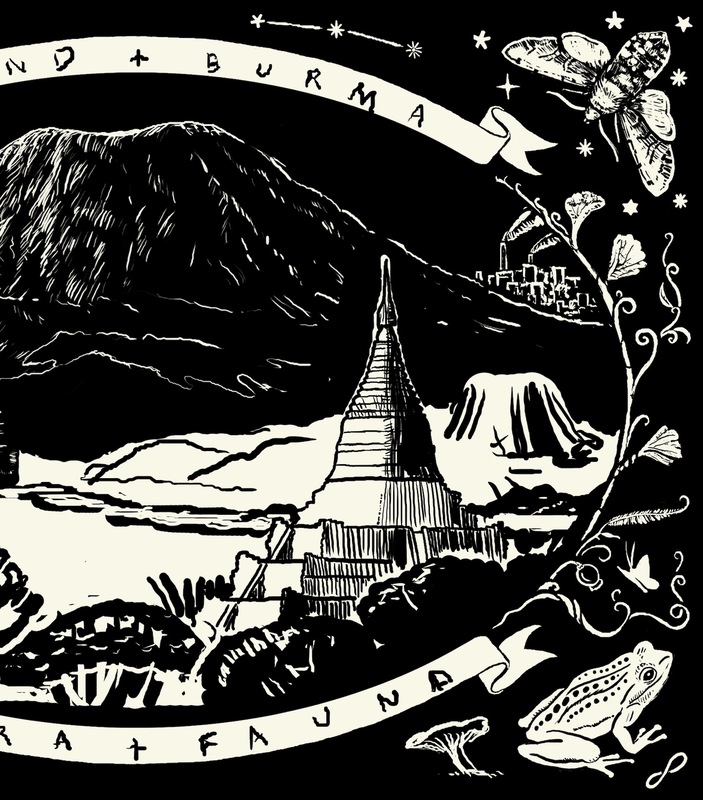 This is a print design (work in progress) that will feature a landscape based on Bagan, Burma. 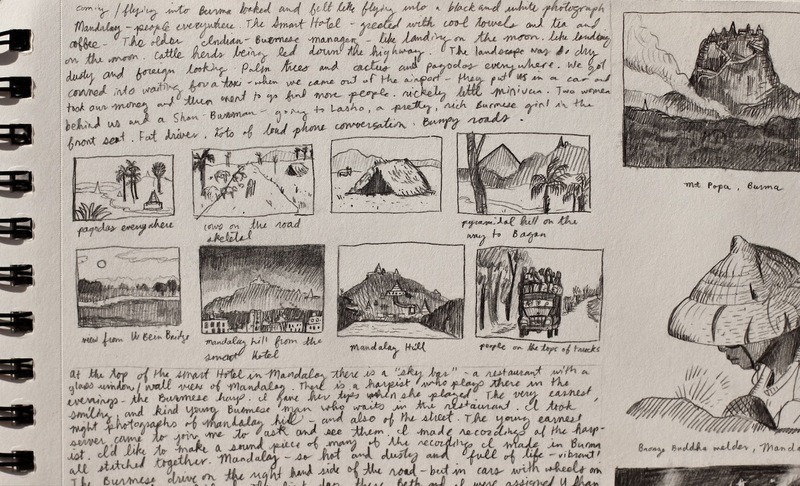 Detail from my Burma travel sketchbook with notes and thumbnail drawings of things I wanted to remember. The initial round of prototypes for the first of two postcard-sized prints is under way. 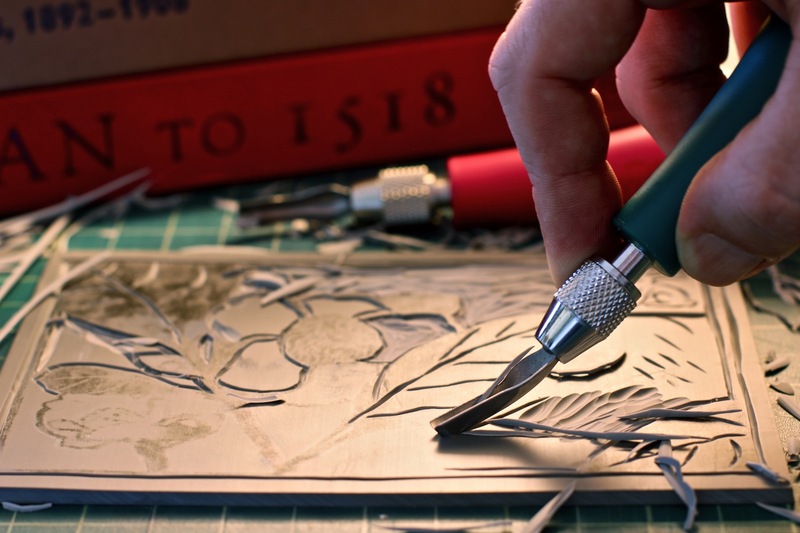 The drawing is first transferred to a linoleum block plate, in reverse, so that when it is carved and printed, the design will be facing the correct direction. 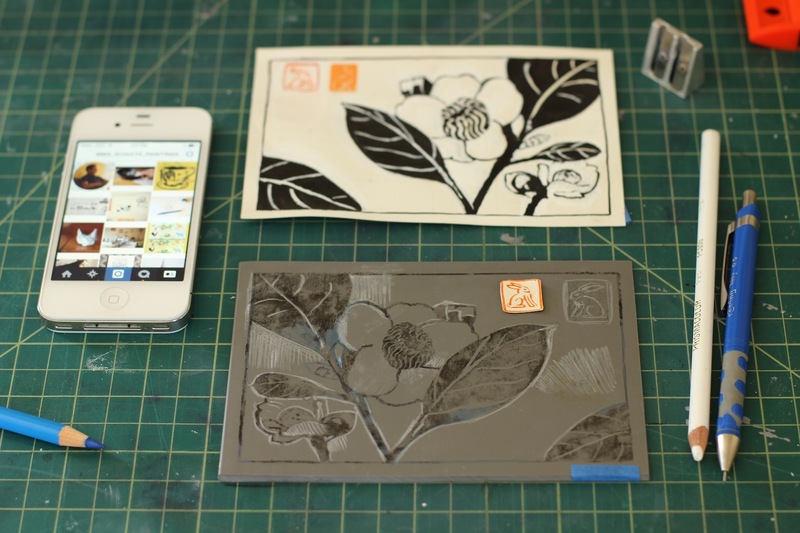 Transferring an ink and gouache drawing of the Camellia Kissii flower to a lino block (in reverse) before carving. Carefully carving the linoleum block late into the night. (No mistakes, please! There is no undoing a carved line). Prototypes! Working out the lines and stamp designs for the first of the smaller prints to go out. This one is so close! 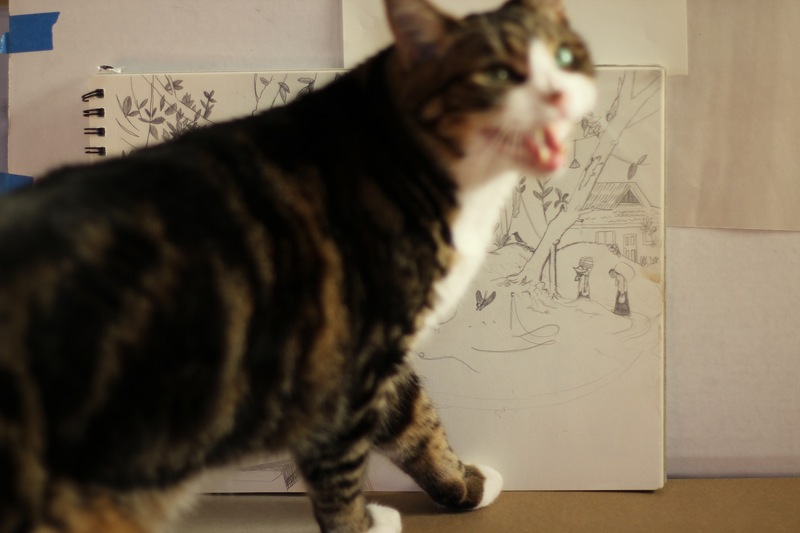 Documenting my Burma travel sketchbook drawings with help from studio assistant and constant shadow, Gus! 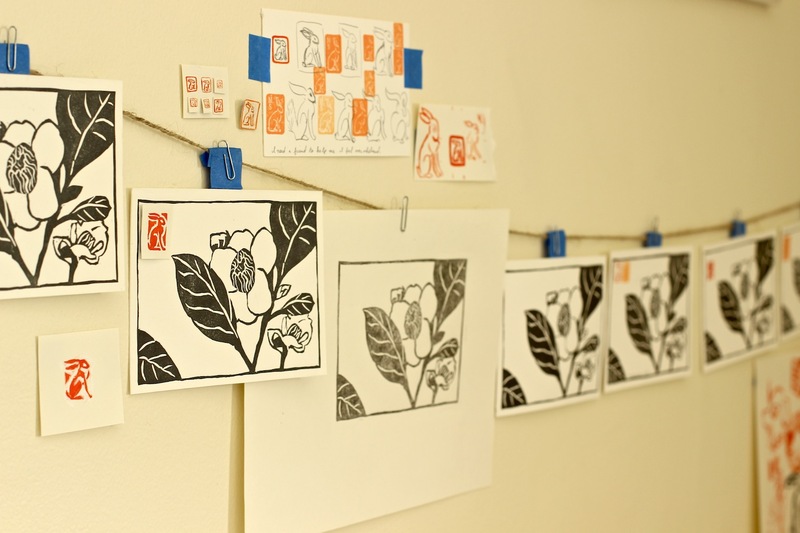 § 4 Responses to Linocut Prototypes + Bagan Drawing Giveaway! I really enjoy seeing your documentations, Mikey. And that little drawing is stellar! 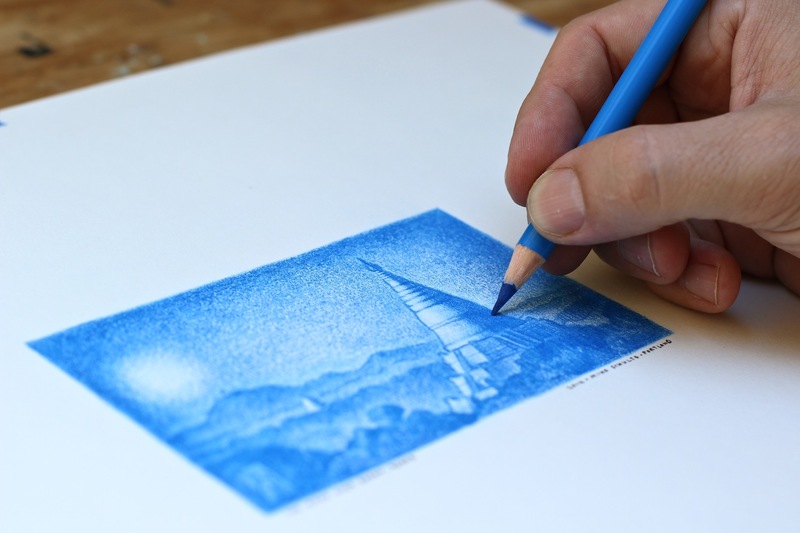 -maybe I should say lunar:) It is interesting (and effective) how you have adapted your mark making to this blue pencil. I have never seen you draw quite that way, and I think it is pretty nice. You have presented it well with your choice of frame and matte. Congratulations on all your work so far on this project. Thank you for the notes, my friend! They are very helpful to hear. I am just seeing this comment now. I need to start checking in regularly with wordpress again to see what I am missing. In some ways the small drawing IS a totally different style, but what is funny is that is pretty darn close to how I use to make art 20 years ago- that is: slow gradations with colored pencils! I made a lot of drawings like that until I went to art school and those Modernists taught me to feel ashamed of the pencil that is colored… What goes around, comes around! I appreciate the notes on the framing too. There is so much to do! Very intricate and beautiful work. This entire project is fascinating in scope and variety. Thanks so much for the kind comment, Steven! I appreciate it. More to come with it soon! Just finished the first batch of prints. 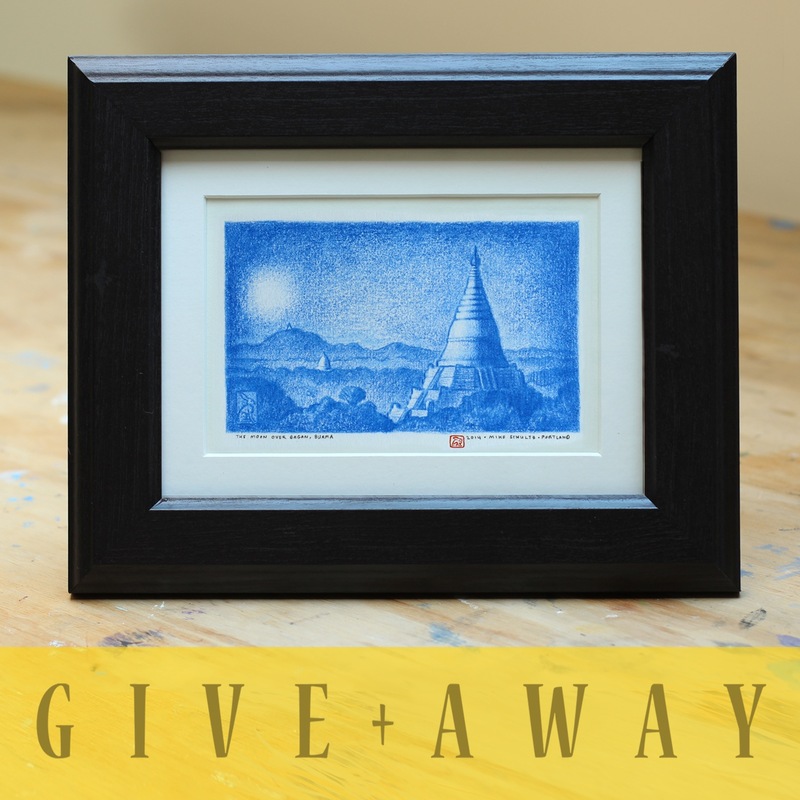 You are currently reading Linocut Prototypes + Bagan Drawing Giveaway! at Mike Schultz Studio Blog.